This second season of This Is Us has been interesting. For starters, it’s nowhere near as emotional as the first season was, for better and worse. Until last night’s episode, “Number Three,” I’d only shed tears maybe once. That ALL changed last night, though, buddy. 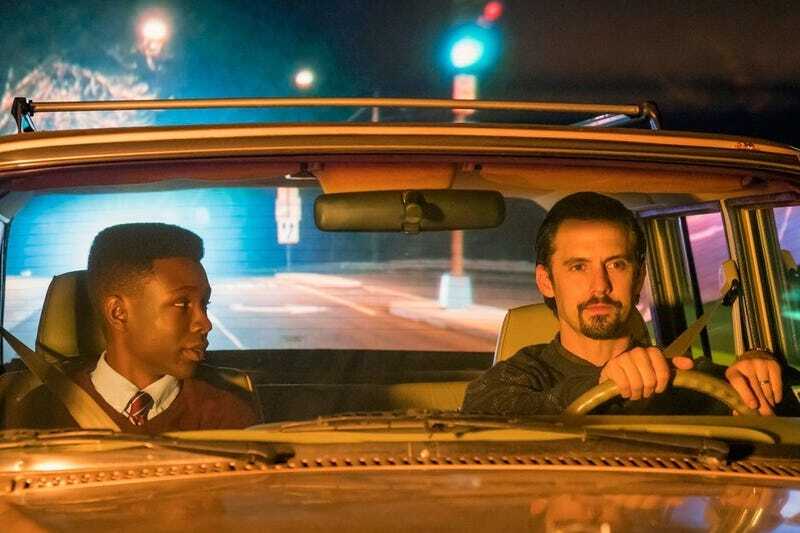 See, after dedicating episodes to the backstory for Kevin and watching him deal with his addiction and seeing Kate grapple with her miscarriage, This Is Us took us here pow and took us there pow and got to the storyline that most of us melanatinous individuals care about: Randall and Beth and, namely, some of how Randall became who he is. In this particular episode we see Randall as a high school junior who is trying to figure out where he’s going to college and has taken an interest in the seminal HBCU Howard University because he’s an adopted black male teenager working through his identity issues and there’s nowhere better to dig into your blackness than an HBCU. But the show didn’t just talk about about him being interested. Heaven’s no. After setting us up for two weeks with Jack and Randall taking a trip to visit a college, we find out the trip is TO Howard University. Yes, This Is Us and NBC ventured to one of the blackest places in America: the actual campus in Washington, D.C. I’m pretty sure I heard a few hallelujahs in the air tonight. We have shots in Howard’s Founder’s Library and the quad, a cat rocking Phi Beta Sigma gear and the moment Randall’s life probably changed, when we see some black women who clearly set this man on the path toward Beth. It’s like we see the seeds of Randall’s comfort in his own skin as a black man. He’s a black kid whose entire life is white who is seeing a campus full of people who look like him. Even if he doesn’t go to Howard (I can’t remember if we know that he did, though it seems like he was really heading down the road to D.C.), he’s seen the glory. It’s a glory that many of us who have gone to HBCUs see at some point, either on a campus tour or early on in our matriculation. You see a sea of beautiful blackness striving for better and for greatness. That’s what we saw a glimpse of last night on prime time. It’s been a good long while since that’s been the case. And you know what? I appreciate that. As opposed to creating some nonexistent HBCU and utilizing a random campus, they took us right to one of the gems of black America, and while we weren’t entirely wrapped in the history of Howard, what we did see was Randall feeling at home. And there was the moment where his blackness felt so comfortable that he hesitated to introduce his father to his new friends because, like many things in life, it’s complicated. He then goes on to explain to Jack, the father he clearly loves more than anything, how that immediate unexplainable thing that bothered Jack about Randall’s hesitation is how Randall feels all the time. It’s like for the first time, he felt ... home. On an HBCU campus. And because there’s NO way that they were going to film on Howard’s campus without some of that HU pride coming through, when they’re leaving campus, somebody hit them with the hee by yelling out “HU, you know,” which made this Morehouse graduate well up with pride. This Is Us took Howard to prime-time television. Getting back to what changed with tonight’s episode, I’d be remiss if I didn’t mention that this was the first one I found myself tearing up involuntarily. Deja’s mother’s charges have been dropped, so she’s come to get her daughter. Randall and Beth, of course, are against it, but Randall comes to the realization that they can’t keep her from her mother and tells a ridiculous story about Pac-Man that even Beth is confused by, but it leads to the moment where Deja’s mom shows up and they have to say their goodbyes. When Deja and Randall hugged and he started that prideful ugly cry and you can see Beth in the background having a moment, well, my entire thug was lost to the game. All of it. I was super black and emo in the same episode; I’m pretty sure this is the moment when NBC was going to buy NBC, because I do NOT see this happening again. Last night’s episode was basically Ralph Tresvant in 1990 wearing an African medallion while Carl Thomas watched on with an Avirex jacket.